Apart from myself I only know of one other person who makes Soundtrack-of-the-month compilations. That person is Tonio van Vugt, and I think that he makes more of them than I do. So far I finished only four monthly soundtracks, while Tonio did one every month. But the latest CD that Tonio sent me is called ”The soundtrack of the summer of 2008” , which seems to indicate that he is not planning to make more than one compilation this summer. So, if I do a little extra effort, I should be able to do three and maybe win this years compitition with Tonio. Of course, the music on my CD’s is much better than the crap that Tonio selects for his Soundtracks-of-the-month. I must say that he is really doing his best this year: I have been playing his CD’s more than my own one’s. Only for studying, of course. Tonio has a passion for British bands and one of his favourite bands is a band that is one of my least favourite bands. I will not mention their name. Because Tonio knows that his CD’s are so much less interesting than mine, he usually compensates them with some extra’s. This time he sent me a copy of the comic book that Wasco made for Microbe, his own private publishing company. 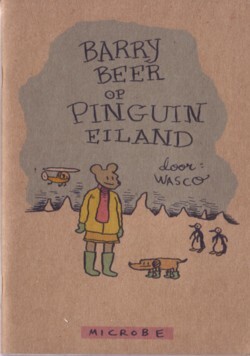 Wasco draw this 24 page comic ( ”Barry Beer op Pinguin Eiland” )on October 21st of 2007, in one single 22 hour session. Holy cow! The pages are “numbered” with the exact time that he finished them; a very nice idea.